One Bowling Green, between State and Whitehall Streets. 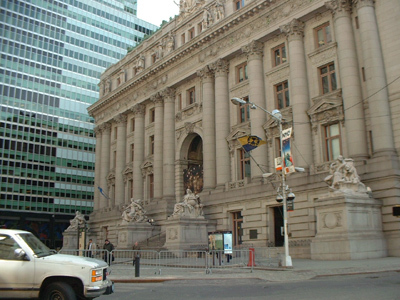 Alexander Hamilton Custom House (National Museum of the American Indian and Federal Bankruptcy Court)/originally U.S. Custom House, 1 Bowling Green, bet. State and Whitehall Sts. to Bridge St. 1899 - 1907. Cass Gilbert. 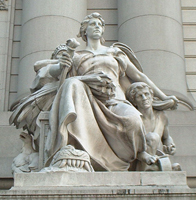 Sculptures, "Four Continents": E to W: Asia, America, Europe, Africa, Daniel Chester French: Adolph A. Weinman, associate. Cartouche at 7th-story attic, Karl Bitter. Rotunda ceiling paintings, 1936-1937, Reginald Marsh. Partial interior. Alterations for the National Museum of the American Indian, 1994. Ehrenkrantz & Ekstut. Museum open 10-5 daily. 212-283-2420. One of the city's most splendid Beaux Arts buildings. The monumental sculptures by French are very much part of the architecture of the façade, their whiteness-and that of those at the attic by other sculptors are a rich counterpoint to the structure's gray granite. No less grand is the interior, whose giant oval rotunda, embellished by Reginald Marsh's WPA-commissioned murals is the crowning architectural space. 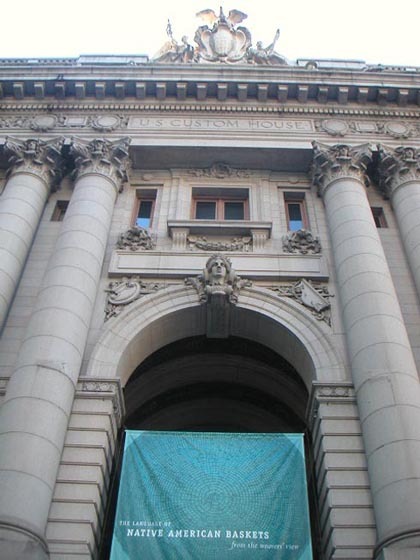 It has remained vacant except for temporary activities since the Customs Service vacated the Custom House in favor of the World Trade Center in 1973. The Museum of the American Indian has infilled much of these spaces since its installation. 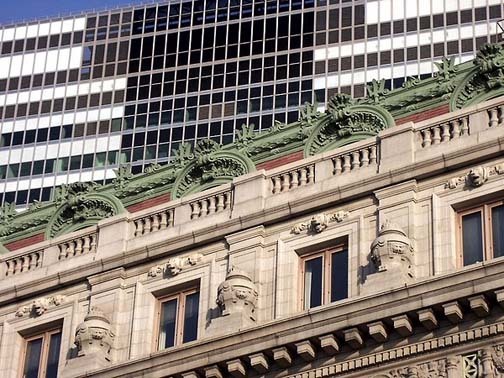 A superb example of Beaux Arts architecture - the Alexander Hamilton US Custom House at the southern tip of Manhattan - has had exterior and ceremonial interior spaces restored and/or conserved while old office space was renovated for modern use. Restoration and conservation included cleaning the building's Bowling Green facade and cleaning and/or conserving interior murals, decorative paintings, woodwork, metalwork, and marble. Renovations adapted space for Federal courtrooms and ancillary offices, for offices for future tenants, for meeting rooms, and for a 350 seat auditorium with state of-the art projection facilities. Upgrades of fire-safety, security, telecommunications, and heating, air conditioning, and ventilating systems accompanied alterations. Preservation of the Custom House has attracted much public attention. 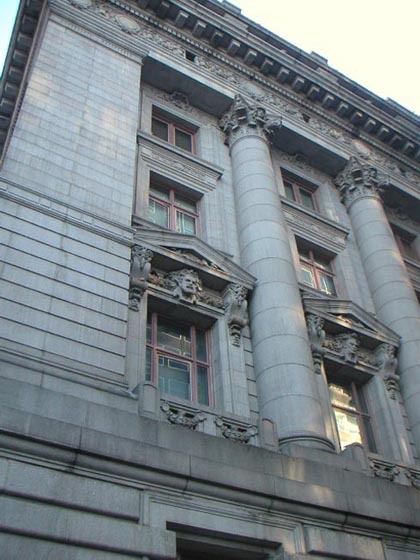 The building is on the National Register of Historic Places, and it was one of the earliest designations of the New York City Landmarks Preservation Commission for both exterior and public interior spaces. 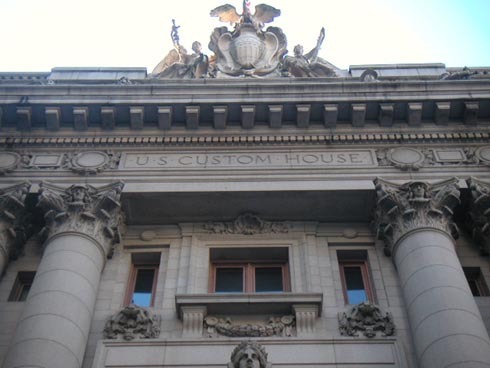 The Custom House was designed by the prominent architect Cass Gilbert and constructed between 1902 and 1907. It incorporates Beaux Arts and City Beautiful Movement planning principles and combinations of architecture, engineering, and fine arts. 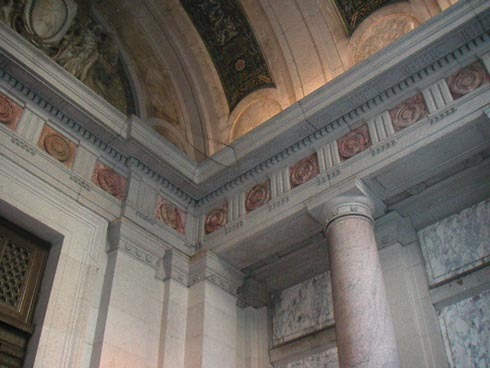 Lavish sculptures, paintings, and decorations by well-known artists of the time, such as Daniel Chester French, embellish the facade, the two-story entry portico, the main hall parallel to the facade, the Rotunda, and the Collector's Reception Room. The preservation of this fine art was accomplished by an unusual series of subcontracts. Preliminary investigations revealed that much artwork had been executed in unique materials and complex applications, some of which had deteriorated over time. Thus, careful research was necessary before restoration could even begin. (For example, murals painted by Regional Marsh in the Rotunda were on a special sand-rich plaster too delicate to be cleaned and requiring conservation treatments.) Selected fine arts conservators bid on restoring particular works. Each conservator surveyed his task, recommended materials and methods, tested the approach, and completed the job under the eye of recognized experts. Each step of restoration was documented, and copies of the compiled research were given to the U.S. General Services Administration and to the National Archives. The Alexander Hamilton U.S. Custom House (originally U.S. 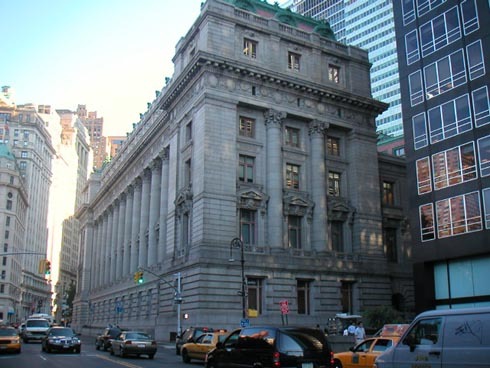 Custom House) is a building in New York City, built 1902 - 1907 by the federal government to house the duty collection operations for the port of New York. It is located near the southern tip of Manhattan, next to Battery Park, at 1 Bowling Green. 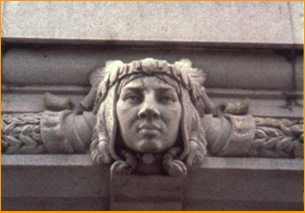 The building is now the home of the New York branch of the National Museum of the American Indian. The building was designed by Minnesotan Cass Gilbert, who later designed the Woolworth Building, which is visible from the building's front steps. He moved to New York from Saint Paul, Minnesota, and set up a practice. It was constructed between 1902 and 1907. It is a masterpiece of the Beaux-Arts style, where public transactions were conducted under a noble Roman dome. It incorporates Beaux Arts and City Beautiful Movement planning principles, combining architecture, engineering, and fine arts. 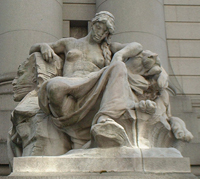 Lavish sculptures, paintings, and decorations by well-known artists of the time, such as Daniel Chester French (the seated groups of the Four Continents on the front steps), Louis St. Gaudens and Albert Jaegers, embellish the facade, the two-story entry portico, the main hall parallel to the facade, the Rotunda, and the Collector's Reception Room. Sculpture was so crucial to the scheme that the figure groups had independent contracts. 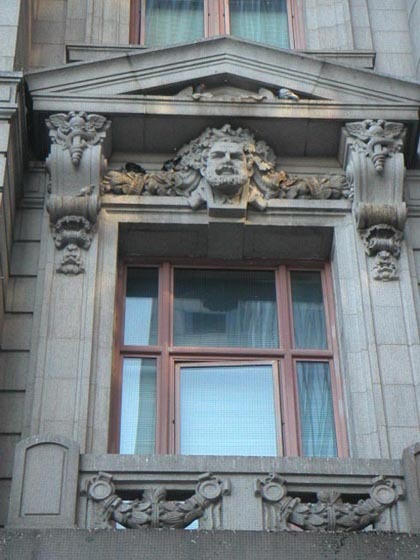 Above the main cornice are standing sculptures representing the great sea-faring nations, representing American sea-going commerce as the modern heir of the Phoenicians. 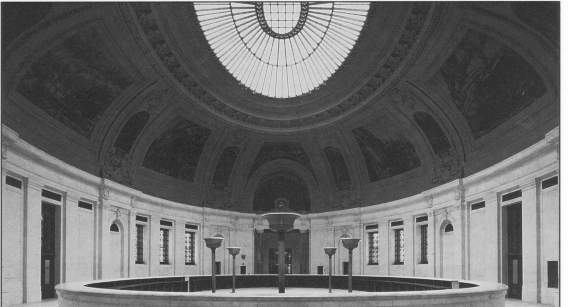 In 1936, during the Great Depression, the Works Projects Administration commissioned murals for the main rotunda from Reginald Marsh (illustration, right). The building sits on the site of Fort Amsterdam, the fortification constructed by the Dutch West India Company to defend their operations in the Hudson Valley. The fort became the nucleus of the New Amsterdam settlement, and in turn, of New York City. The building is on the National Register of Historic Places, and for both exterior and public interior spaces. 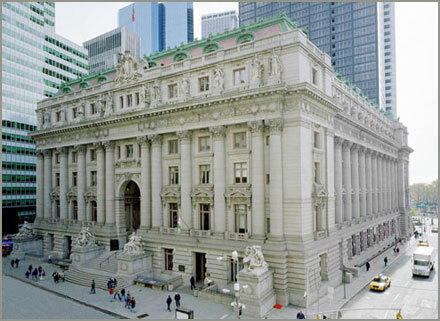 The Customs House was one of the earliest designations of the New York City Landmarks Preservation Commission, so in 1987 the completion of its preservation, spurred by Senator Daniel Patrick Moynihan who saved the building from demolition in 1979, attracted much public attention: exterior and ceremonial interior spaces were cleaned and restored conserved, while old office space was renovated for Federal courtrooms and ancillary offices, for rental offices and meeting rooms, and for a 350-seat auditorium with state of-the art projection facilities. Upgrades of fire-safety, security, telecommunications, and heating, air conditioning, and ventilating systems accompanied alterations. 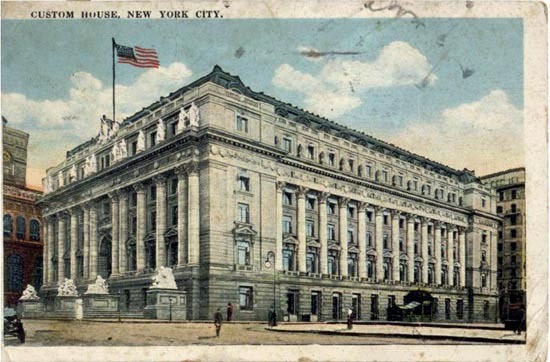 ^ a b c United States Custom House (New York). National Historic Landmark summary listing. National Park Service (2007-09-13). 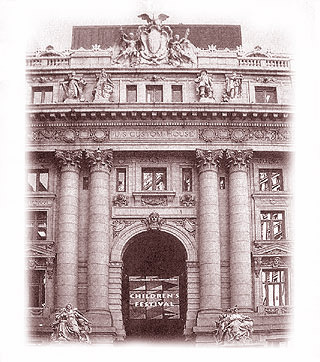 ^ ["United States Customs House", August 1976, by Carolyn Pitts, PDF (557 KiB) National Register of Historic Places Inventory-Nomination]. National Park Service (1976-08). 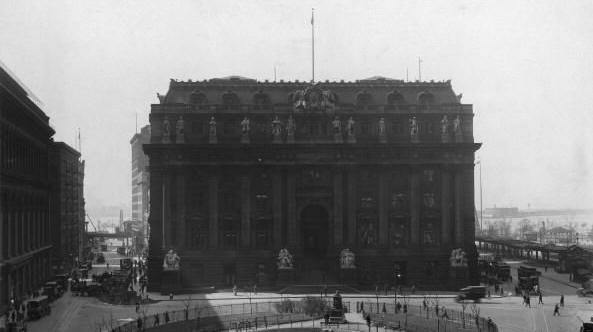 ^ [United States Customs House--Accompanying photos, exterior and interior, undated.PDF (1.86 MiB) National Register of Historic Places Inventory]. National Park Service (1976-08). For much of its history, New York City has been the most significant port city in the United States of America. Before a federal income tax was imposed in 1916, a primary source of revenue for the federal government was custom duty. With New York City the country's most active port, New York has had a Custom House since the country's founding in in 1781. 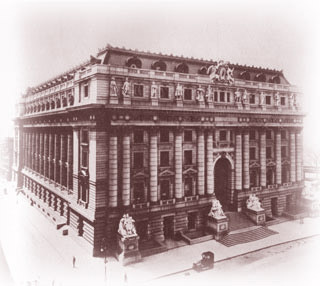 In 1899, the United States Department of the Treasury sponsored a competition to build a new U.S. 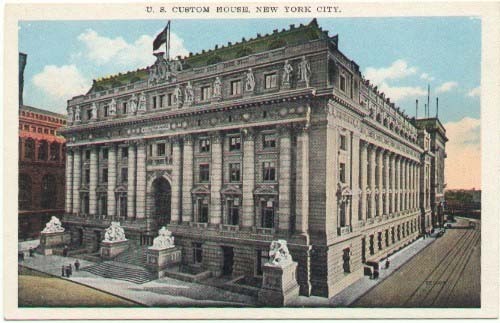 Custom House on a site in Manhattan known as "Bowling Green." This was the site where, in 1626, a group of Dutch settlers "bought" Mahnattan Island from Indians for about $24.00 worth of beads. The competition was won by Cass Gilbert (1859-1934) who hailed from St. Paul, Minnesota. 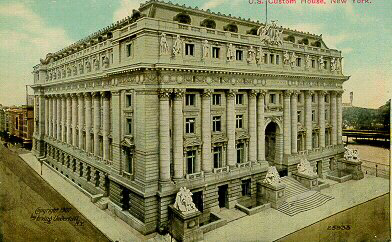 His magnificent Beaux Arts building not only contained the rooms necessary for collection of Custom tariffs, but was designed to show the greatness and grandeur of the United States. The seven story structure contains 450,000 square feet of space and sits on three city blocks. It was richly decorated inside and out, including dozens of sculptures and carved images which grace the exterior of the building. Construction of the Custom House was begun in 1900 and it was completed in 1907. The building was subsequently abandoned in the 1970's and was scheduled for demolition before being saved and restored in the early 1980's. 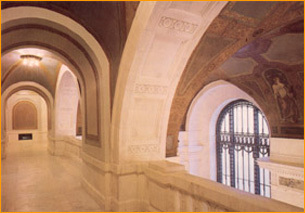 In 1987, the United States Bancruptcy Court for the Southern District of New York occupied the building and in 1994, the Smithsonian Institution's National Museum of the American Indian took over two floors of the Old Custom House. 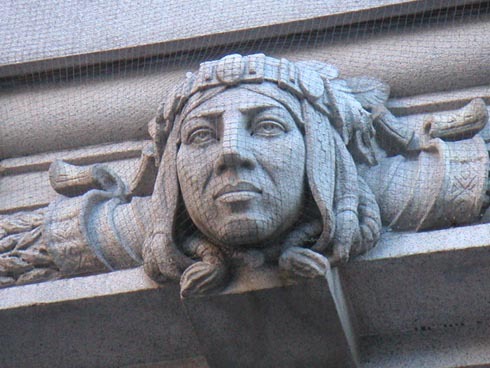 Central to Gilbert's design of the Custom House were four separate sculptures to be placed at the front entrance of the Custom House, representing four continents (from left to right) - Asia, America, Europe and Africa. Gilbert asked both Daniel Chester French and August Saint-Gaudens both to submit designs for the scupltures. Saint-Gaudens declined the invitation, citing other work he was occupied with, so French received the commission. French began designing the sculptures of "Continents" in 1903 and they were completed and installed in 1907 . Art scholars consider French's "Continents" to be perhaps the best examples of architecture sculpture in the United States. Each of the four "Continents" are rich in imagry and detail. Each represent a view of the continents through French's early 20th century lens: Asia and Africa are still cloaked in mystery, Europe is in the waning years of its colonial conquests, and America (representing primarily the United States) is emerging as a new, vibrant society. Click on the images below for photos of each of the "Continents" as well as commentary on the images which make up each group. Daniel Chester French: Continents: Asia. Gateway to images of Daniel Chester French's sculpture, "Asia," found at the Old U. S. Custom House, New York City, New York. 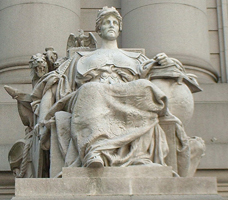 Daniel Chester French: Continents: America. 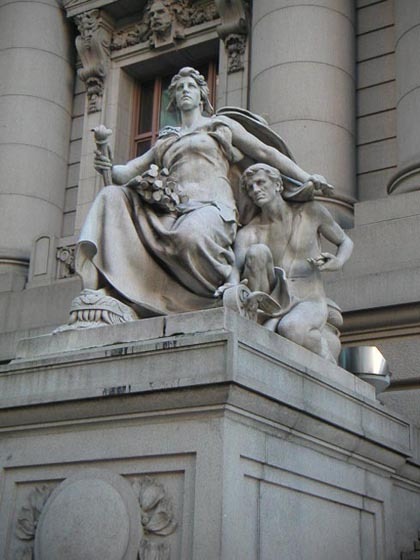 Gateway to images of Daniel Chester French's sculpture, "America," found at the Old U. S. Custom House, New York City, New York. Daniel Chester French: Continents: Europe. 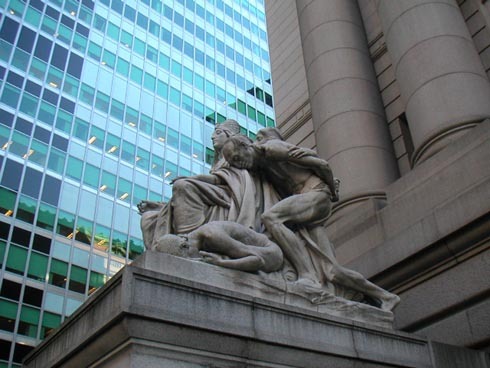 Gateway to images of Daniel Chester French's sculpture, "Europe," found at the Old U. S. Custom House, New York City, New York. Daniel Chester French: Continents: Africa. 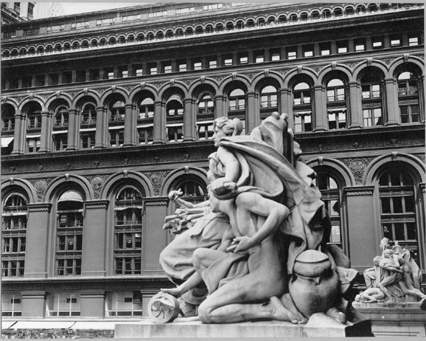 Gateway to images of Daniel Chester French's sculpture, "Africa," found at the Old U. S. Custom House, New York City, New York.